I don’t really believe in writer’s block as a real thing. It is simply a form of resistance coming from within. When writers speak of “having writer’s block,” they make it sound like a virus you can catch and they look for remedies to ‘get rid of it’ but they are looking in the wrong places. It’s an inside job. You have to look within. Writers experience myriad forms of resistance and most of them are very sneaky and stealthy. You don’t always know when it’s happening. You have to search for the reason why you are resisting opening up to Creative Flow. There is a psychological block in the stream. Removing it starts the flow again. I’ve found, when I do this, the result is immediate and glorious. First: I listen to Natalie Goldberg’s Writing Down the Bones on CD. Natalie did a tenth-anniversary version of Writing Down the Bones as an audio book, where she reads the book (the first book she ever wrote) and then comments on her own writing from the perspective of someone who has had ten more years of experience. She speaks directly to the writer in all of us, to our fears and faults, our insecurities and doubts, our soaring creative spirit and our earthbound reality issues. She is eloquent and inspiring. This book is healing for me in many ways. It never fails to bring me back to myself and back to my writing. Second: I take a time-out from the book I’m working on / having trouble with, and focus on music. A) I play my guitar, sing, write a song. B) I go to iTunes and create a soundtrack for the book I’m working on as if it were a movie. I focus in on orchestral pieces that embody or support the “feel” of the story arc and add a more modern tune at the beginning and end (like a credit roll song). Concentrating on something that is not writing but still creative helps to clear the mind and when I return to my book I have a fresh perspective AND a cool soundtrack to play while I’m writing that is wonderfully inspiring. It is very effective for getting the creative juices flowing again! If you are a writer or an artist try this the next time you get stuck! Side Note: Envisioning your book as a movie helps in other ways too. Thinking in the visual mode makes for great, concise descriptive passages and snappy/lively dialogue. And, of course, it is a lot of fun! Third: I hit the road. If the first two don’t do the trick, I plan a road trip. Getting out of town, even just for a few hours–taking myself out of my daily routine–has never failed to get me unstuck. New surroundings and new experiences inspire me to write new thoughts. I take my laptop, but almost always end up just writing in my journal. There is something about putting pen to paper that creates that “flow” we all love as writers. It’s very organic. I come home refreshed and ready to work. And now, with AirBnB.com it is easier than ever to get a room in someone else’s home for a few days without breaking the bank. And who knows, you just might be inspired by the people you’re staying with, in addition to the beauty that surrounds you. I highly recommend it! I meet myself . . . the best version of me . . . when I travel. Fourth: This one is the most radical and for me the most foolproof method for breaking out of Resistance Mode. I stop reading books! Yep, you heard me right. Stop. Cold turkey! Here’s why it works: You see, I’m addicted to story (most writers are), and if I can’t get my fix through other people’s books I will get it through my own! It WORKS EVERY TIME! PS: No TV or MOVIES either. Cold turkey means eliminating all forms of story in my life so that my only outlet is through my own stories! Just kidding. I mostly drink tea these days, but an occasional cuppa joe is a nice perk! FUN: Building whole worlds using nothing but a vivid imagination. LOVE: You get to fall in love over and over again with each new character. FREEDOM: Which to me means waking up in the morning and asking yourself, “What do I want to do with my time today?” and having the answer be, “I want to work on my book.” And then being able to do so! PERSONAL GROWTH: Always learning new things, expanding your world and opening up to new and different points of view when researching for a story, is a wonderful, never-ending source of education and intrigue. COURAGE: Having a book out in the world challenges you to push past your comfort zone and can even teach you that you are braver than you think. TOUCHING PEOPLES LIVES: Having readers write you to say how much they love living in the worlds you have birthed, or to let you know that your words helped them get through a difficult time in their lives, makes it all so worth it. INSPIRATION: Being a writer means opening up to inspiration and letting things come through. Once that portal is open, it can inspire you in many other ways. It can ignite your soul. I have a very mischievous muse, always sending me ideas when I least expect it! GRATITUDE: I love my life and I am so grateful to be able to create freely (and to live in a country that allows full creative freedom). Don’t intrude upon your characters. During a Q&A following one of my college plays that was being workshopped, an audience member gave me this little gem of advice. I was young and didn’t understand it at the time, but it resonated in me for days, months, even years, and I came to understand what it meant, and once I did, it changed my writing forevermore. Let your characters tell you what they want to say and do. Don’t force your opinions on them, your values, your point of view. They have their own unique point of view, and if you listen, they will tell you who they are, and who they need to become on their journey. Know the difference between Active and Passive Voice. Active voice draws the reader into a story, passive voice makes the reader feel like an observer. ☆ In passive voice, the subject does not do the action, the action is done to the subject. ☆ In active voice, the subject is engaged in the action. It is common for writers new to the craft to use far too much passive voice. Tip: Look for the over-use of the word “was” or “were.” They are signs for passive voice. And remember, there is a place for both passive and active voice in writing. Many will have you thinking: Active Good. Passive Bad. The truth is, it’s up to the writer to decide which is appropriate for each scene, or more accurately, each paragraph. For me it’s all about perspective, rhythm, and tone. I choose which voice is appropriate for the pacing and feel of the paragraph, as well as the POV of the scene. Write what you don’t know. Everyone tells aspiring writers to “write what you know,” but in my experience that is just too boring. I would change that to “write what you want to know and do the research!” When I start a novel, I spend three-quarters of my time researching and a quarter of my time writing. Writing what I already know is a “safe zone” that, for me, produces listless prose. Break out into new territory, uncharted waters, and inspiration abounds. Once you are exploring new worlds, writing new worlds, what you know and who you are will come through organically. Recognize resistance when it comes up. I mentioned this above (in Writer’s Block) but I think it’s worthy of elaboration. It can be a writer’s undoing if they are not aware of it and what’s going on inside. There are many forms of resistance. Even getting a “brilliant idea for a new book” can be a form of resistance if it takes you away from the story you are currently writing! Writing can flow and it becomes enjoyable, but there are times when it is just plain HARD WORK. In the hard work phases of novel writing, resistance pops up in a thousand different disguises, all perfectly tailored to your individual needs and desires. Once I have identified the problem of resistance, I usually stop what I’m doing and return to work. Then I keep an inner-eye on it, see if it happens again. If it comes up again, I take a moment and dig for the root cause. Sometimes finding the reason behind your resistance is the only way to get back into Creative Flow. 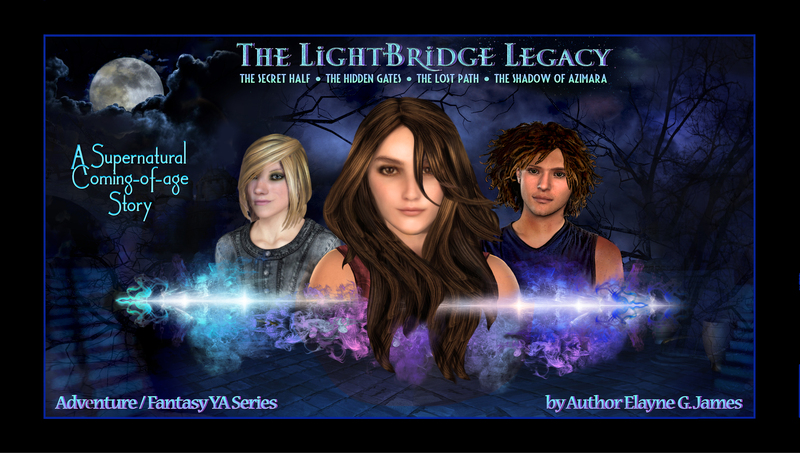 Now that the re-release of The LightBridge Legacy Book I: The Secret half, is out, with a new name, new cover, and new scenes, I am working on the final edits for Book II: The Hidden Gates (which should be released summer 2019). Next, I will go straight into the final edit of Book III: The Lost Path which will be released as soon as it’s done. After the release of my holiday novel, The Saint of Carrington: A Christmas Story of Hope, Healing and the Power of Believing, I found myself working on ideas for a second book, quite unexpectedly, which I will be outlining this year and writing next year. It will be set in the early 1900s and it will follow William’s ascension to Santa status. And finally, I have begun writing a wonderfully fun new series called The Dragonbond Books, about an orphaned boy who is raised in the basement apartment of a 200-year-old library in Boston, and on his 9th birthday, inherits a dragon egg along with a book written in an ancient language that depicts the proud lineage of his ancestors; a people called the Dragonbond Tribe. I am having a blast writing it. It’s basically a “boy and his dog” story but the dog is a dragon and they get into all manner of mischief together. Dreams are a huge thing for me. If I write late into the night, my brain continues writing while I sleep. I dream entire scenes that go into the book the following morning. Also, doing research for a story or a character is a powerful way to get inspired. I do tons of research before and during the writing process. I really enjoy it because the story becomes real to me and my fictional characters come to life with real-world details. If possible, I go and role-play my characters out in the world. I once wrote a story where the main character was handicapped, so I rented a wheelchair and spent an entire day in it. I went to the mall and learned not only how difficult it is to get around (how many places you just can’t go), but also how incredibly different people treated me. What an amazing lesson that was! And when I was ready to write that character into my story (in his POV), I had a bit of firsthand experience to draw from that added depth to the character’s inner life/emotions. Where did you get the idea for your most recent book or books? The LightBridge Legacy came from a reoccurring dream I had as a child where I was in possession of a magical device that could take me anywhere (or when) I wanted to go in the blink of an eye. The Saint of Carrington came from a conversation I had while working in theatre. We (the stage crew) were all talking about the time our parents finally broke the news that Santa Claus didn’t exist and I said,” my parents never told me that Santa Claus doesn’t exist so I still believe.” I was in my early-twenties at the time. We all laughed, but it gave me an idea. When I got home, I jotted down the idea in short story form, about a Christmas town that had lost its faith in Santa Claus and a boy who had lost his father in a tragic accident on Christmas eve, and how they, together, all learn to believe in the magic of Christmas again. The Dragonbond idea came from a long-standing desire. I always wanted to write a dragon story. Then one day I wrote the line: My name is Secret.” and that is how it started. A boy named Secret and a Dragon named Taz. After that, I was hooked. It doesn’t take much. I am a nerd through and through. Previous Post Cover Inspiration: My Favorite NYC Secret!